The Ben Youssef Madrasa was the largest Islamic theological college in Morocco. It was founded in the 14th century by the Marinid Sultan Abu al-Hassan and further developed by Sultan Abdallah al-Ghalib in the 16th century in order to rival the madrasas of Fez. 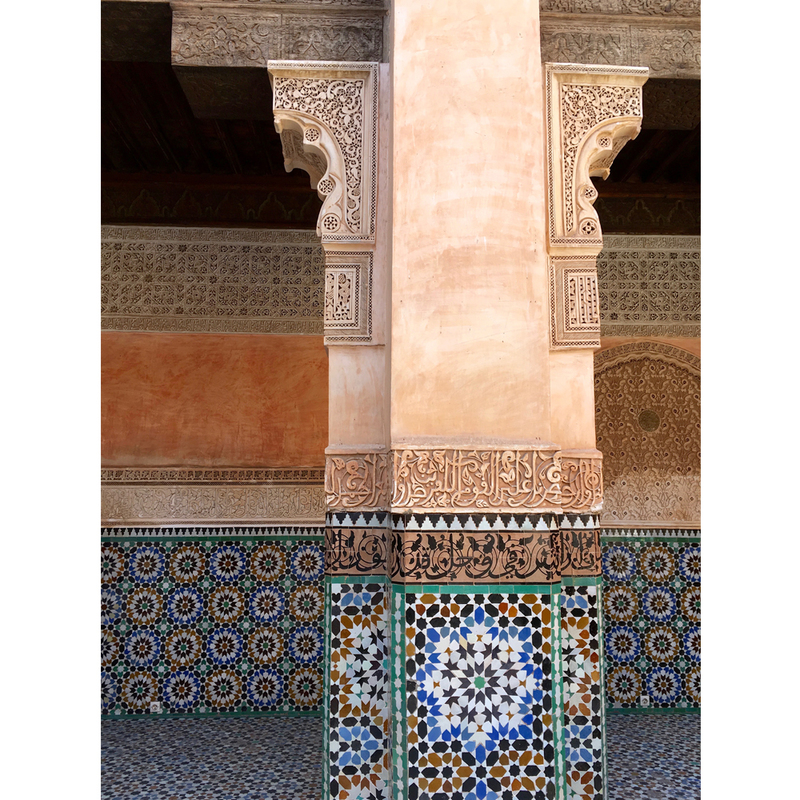 It’s a wonderful example of Moorish architecture, with its carved Atlas cedar windows and wooden lattice screen balconies, five colour zellij tiling, stucco designs on the walls and a marble mihrab, which indicated the direction of Mecca. The main courtyard (below) is breathtakingly ornate and features a large filled basin of shallow water in the centre. The college is no longer in use but there were once students residing in the 132 dorm rooms arranged around the courtyard. In stark contrast to the inscriptions and patterned stucco and colourful tiling on the exterior walls the dorm rooms are small and spartan (final photograph). My advice is to visit the Ben Youssef Madrasa when it opens at 8am before it gets too busy and before the sun becomes too bright to take photos of the courtyard. Click here for directions. If you visit the Madrasa I also recommend that you visit the Maison de la Photographie and see the wonderful collection of old photos of Morocco as it is nearby. Click here for directions. For other suggestions on what to see and do in Marrakech click on Morocco on the right hand side of this blog.